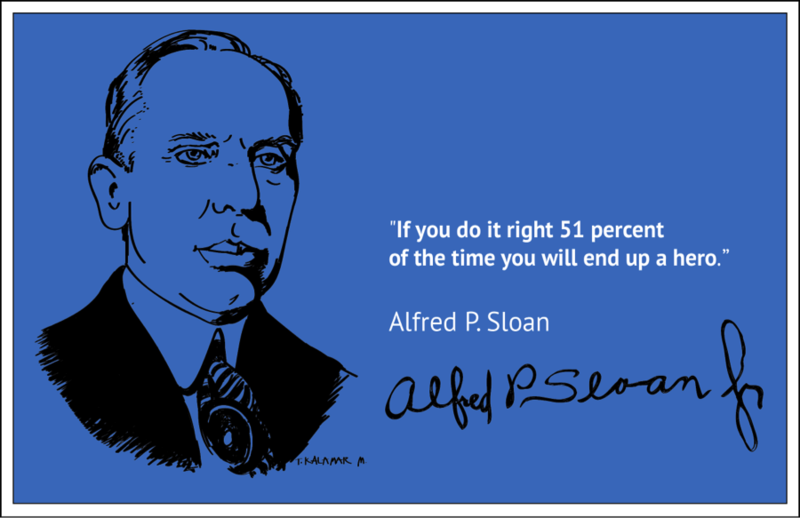 Today is a good day to recall the thoughts of Alfred P. Sloan (born May 23, 1875), who spent three decades making General Motors the largest corporation in the world. Sloan brought together disparate companies supplying and building automobiles to create a whole — the first industrial cluster. My generation had an opportunity unique in the history of American industry. When we started in business, the automobile was a new product, and the large-scale corporation was a new type of business organization. We knew that the product had a great potential, but I can hardly say that any of us, at the beginning, realized the extent to which the automobile would transform the United States and the world, reshape the entire economy, call new industries into being, and alter the pace and style of everyday life.
. . . It was our task to find out what forms of organization were suitable to our company. This meant, above all, an organization that could adapt to great changes in the market. Any rigidity by an automobile manufacturer, no matter how large or how well established, is severely penalized . . . There have been and always will be many opportunities to fail in the automobile industry. 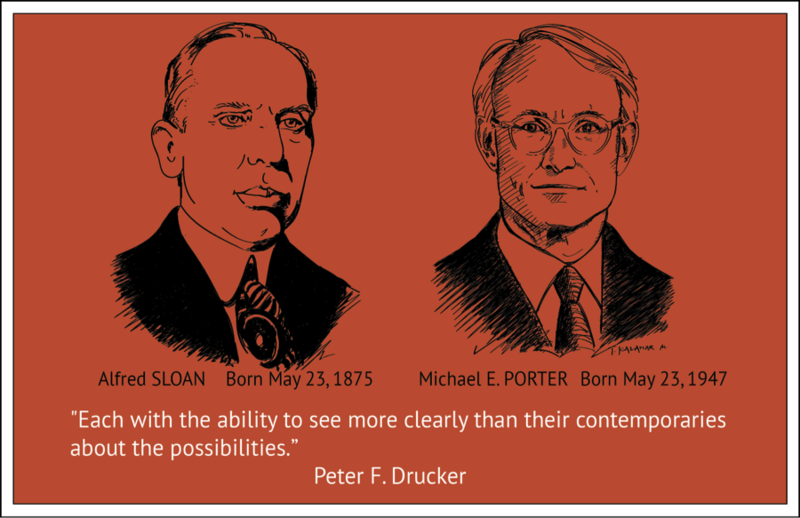 The circumstances of the ever-changing market and ever-changing product are capable of breaking any business organization if that organization is unprepared for change.
. . . To meet the challenge of the market place, we must recognize changes in customer needs and desires far enough ahead to have the right products in the right places at the right time and in the right quantity. In describing the General Motors organization I hope I have not left an impression that I think it is a finished product. No company ever stops changing. Change will come for better or worse. I also hope I have not left an impression that the organization runs itself automatically. An organization does not make decisions; its function is to provide a framework, based upon established criteria, within which decisions can be fashioned in an orderly manner. The task of management is not to apply a formula but to decide issues on a case-by-case basis. No fixed, inflexible rule can ever be substituted for the exercise of sound business judgment in the decision making process. Each new generation must meet changes- in the automotive market…in a changing world. For the present management, the work is only beginning. Some of their problems are similar to those I met in my time; some are problems I never dreamed of. The work of creating goes on. Henry Gantt invented the Gantt charts – a tool I live by. After watching the U.S. fumble initially in World War I, he believed we would have lost the war if the allies hadn’t stepped in and helped. Before and during the war, he’d seen great leaders in management go to Washington and fail, sometimes spectacularly. He was describing a classic management problem — one that all of us know too well from bureaucracies — but this was occurring during a national crisis. “In many cases, these statisticians did not differentiate between that which is interesting and that which is important,” he added. In these days of algorithms, that might sound obvious. But Gantt, who received degrees from the Stevens Institute of Technology and John Hopkins University, was doing pioneering work in the 1910s. Before the war, he’d had been busy developing a bar chart that depicts the start and end dates of key parts of a project. These soon became fundamental in the building of the Hoover Dam and the Interstate Highway System. Tools we could put to use in building infrastructure and restructuring the budget today. The concept was that the full team could see issues and needs, and collectively address them to get the whole completed. 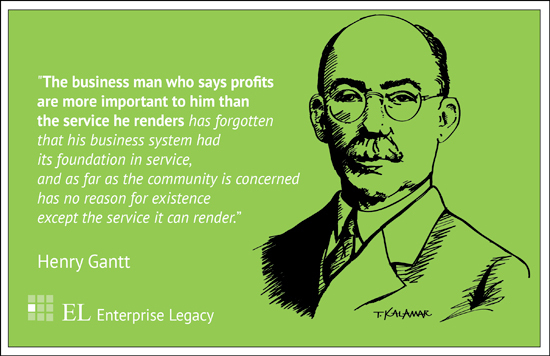 As Roger Martin would say years later, Henry Gantt was an integrative thinker — –possibly the first in Systems Dynamics. More than 100 years after Gantt introduced the charts, they were integral to Alan Mulally’s turnaround at Ford Motor Company. Let us imagine two nations as nearly identical as we can picture them, one of which had a business system which was based upon and supported by the service it rendered to the community. Let us imagine that the other nation, having the same degree of civilization, had a business system run primarily to give profits to those who controlled that system, which rendered service when such service increased its profits, but failed to render service when such service did not make for profits. To make the comparison more exact, let us further imagine a large portion of the most capable men of the latter community engaged continually in a pull and haul, one against the other, to secure the largest possible profits. Then let us ask ourselves in what relative state of economic development these two nations would find themselves at the end of ten years?